Even though we are in the middle of winter here in the midwest, there is still plenty of spring planning going on with our resident woodpeckers. On a crisp winter day, when I walked out onto our deck to check some of the feeders, there is a distinct rat ta tatt tatt on the trees. Having heard this before, I realized that our downy woodpeckers are in the area. They are frequent visitors to our feeders filled with peanut butter suet, a personal favorite of many species, but especially woodpeckers. 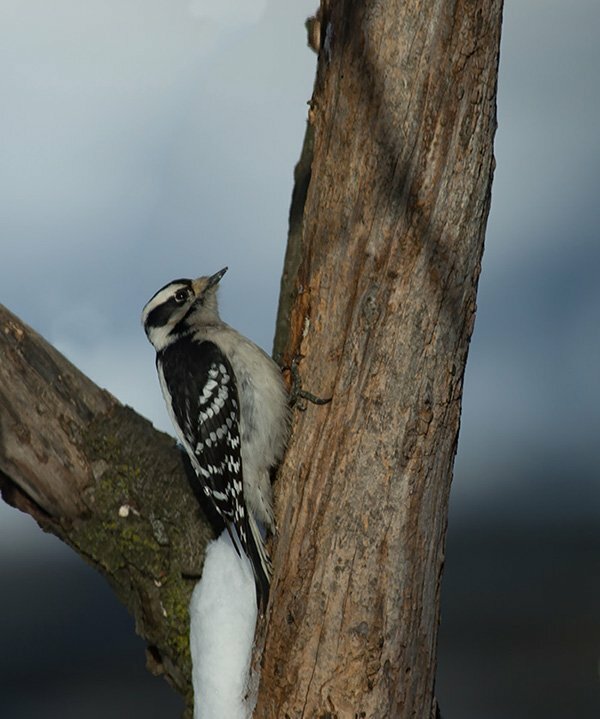 Overall we have 8 different species of woodpeckers in Michigan. To date, I only have 2 of the eight in my files. The chase continues! I post this shot because it is another example of my previous post on exposure compensation as an in camera light shaping tool. This picture was shot at -2/3 EV and natural light. It looks as if a flash was used, but it is simply front lit with the dialed in EV to reduce the highlights. You can even see the sun in the eye which resembles a catch light. Flash is an essential tool for wildlife photography, but that is a whole different post. I have drawn a line in the sand with my wildlife images and I do not crop or post process. That is just the standard that I have set for myself and it really makes me think the image through and get it right in camera.